Create a great project and be good to the earth at the same time with this roomy, lined tote stitched in yarn made from recycled materials. Magnetic-snap closure. 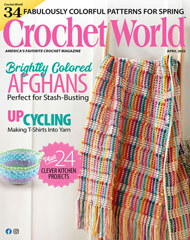 This e-pattern was originally published in the June 2012 issue of Crochet World magazine. Size: 14"W x 11"H x 2"D. Made with medium (worsted) weight yarn and size G/6/4mm hook.